Thanksgiving day is the day we celebrate the blessings in our lives and the day when calories don't count. The holiday season officially begins with enjoying a traditional Thanksgiving dinner with family and friends. Add some football and pumpkin pie and you've created a wonderful memory for everyone. Planning Thanksgiving dinner is fairly simple and involves traditional dishes. Cooking these dishes, however, can be time-consuming and even complicated. In this section of tips, you'll find the information you need to cook the perfect turkey. There are also recipes for many of the traditional side dishes including sweet potatoes, cranberry sauce, and pumpkin pie. 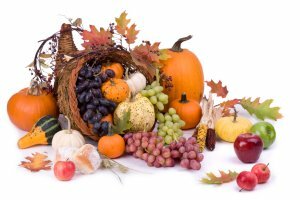 The following articles are available for the 'Thanksgiving' topic. Click the article''s title (shown in bold) to see the associated article. Are you interested in having a particularly juicy and tasty turkey? If so, then you may want to consider brining it. Brining a turkey is remarkably easy, and only requires a few items that you already have around the house. Here's what you do. Choosing a perfect turkey is key to being able to have a great Thanksgiving get together, or simply having a great tasting dinner. Believe it or not, there is more to picking a turkey than going to your local grocery store and picking up a random bird. It seems like there are hundreds of different recipes for cooking turkeys, but the basics of cooking a turkey are all the same. It is important to prepare and cook the turkey safely. Thanksgiving is known for its feast of food. The main dish, of course, being turkey, your worst nightmare would be having it not turn out. Fear no more; here is a fool-proof plan for getting the most delicious and moist turkey you could over bake. What is it about pumpkin pies that so many people love? Is it the fact that they seem inexorably linked to the fall and winter holidays that make everyone think of home? Maybe it's their wonderful flavor and taste? Whatever the reason pumpkin pies are loved the world over, and none more than from-scratch pumpkin pies. Freshly made cranberry sauce can be a wonderful addition to any meal, and doesn't need to be relegated to Thanksgiving meals only. If you are interested in an interesting twist on the traditional cranberry sauce, then you will absolutely love this recipe for some homemade cinnamon cranberry sauce. One of the true wonders of the holiday season has got to be fresh baked, homemade pumpkin pie. For many people the scent of this holiday favorite can bring back and evoke the memories of yesteryear. Here is a fantastic recipe that you can use, which will allow you to share your love of pumpkin pie all year long. The holiday season seems to be the time for cooking baking sweet potato yams. Through the years I have finally come up with an easy recipe that tastes great and that the whole family enjoys. Cranberry sauce is a necessary side to the holiday festivities and you want to have the best kind. Here are a few recipes for you to try out; you can have the perfect Thanksgiving or Christmas with an excellent cranberry sauce!